Shop the entire selection of Bullfrog Spas hot tubs below. Soak in comfort or entertain some friends in this spacious 7-person hot tub. The A8L hot tub comes equipped with a premium bent-knee lounger and therapeutic corner captain's chairs, along with 6 unique JetPaks, each selected by you. With built-in comfort and space, you'll enjoy the ultimate in hydrotherapy and luxury every evening. One of the top sellers for over a decade, the A8D provides the ultimate spa therapy experience with an exclusive 2-lounge layout and maximum therapy options. This hot tub is designed for 5-6 people to relax with space to spare, outfitted with your choice of 5 JetPaks for a comprehensive relaxation experience. A full-featured mid-size spa that feels much larger, the A7 gives you the feeling of soaking in spacious luxury. With dual premium corner captain chairs and 5 JetPaks personalized by you, this is an ideal hot tub for relaxing with someone special or entertaining friends and family. Built for maximum comfort and therapy, this mid-size spa offers 5 rejuvenating JetPak hydromassages and comprehensive spa seating options. The A7L hot tub provides you a variety of comfortable therapy options, including a premium bent-knee lounger with hip, calf, and foot jets. Find inspiration and relaxation right at home, even in a relatively small area. The A6 is a space-saving hot tub on the outside offering a spacious relaxation experience on the inside. With 4 JetPaks of your choice and ample room to spread out and unwind, you'll love this little slice of heaven. Compact, yet spacious, this versitile hot tub is great for urbanites, singles, couples and small families. The A6L seats up to 6 people with 4 personalized JetPaks creating a soothing hydromassage experience to melt away your stress and tension. The perfect hot tub for couples, empty-nesters, and singles, the A5L promotes relaxation and well-being in a size that fits anywhere, including indoors. With its premium lounger, along with massaging wrist, hamstring, and calf jets and 3 customized JetPaks, you'll get a truly personalized and rejuvenating spa experience. The STIL 7 represents a new concept where modern spa design meets usability and comfort. Designed with 2 dedicated lounges, your choice of 3 JetPak massages, and flexible open-concept seating that can be enjoyed in an upright or reclined position in any seat in the spa, the STIL 7 is the ultimate in form and function. An ideal space-saving spa for singles, couples, or those with space constraints, the STIL5 offers modern elegance in a size that fits anywhere, even indoors. With seating that can be enjoyed as a lounge or upright, an impressive modern aesthetic, and 3 customized JetPaks, you'll enjoy both the look and feel. A spacious spa with room to stretch out, the R8 features an open layout and premium corner seats along with wrist, hip, and foot jets for an indulgent spa experience. 4 customized JetPaks of your choice and premium comfort at a price you will love. The R8L is a truly relaxing hot tub in every sense. With a premium bent-knee lounge seat and 4 personalized JetPaks picked specifically for you, you will be able to relax your way. The variety of seating and features make this a premium spa experience at a cost you can afford. 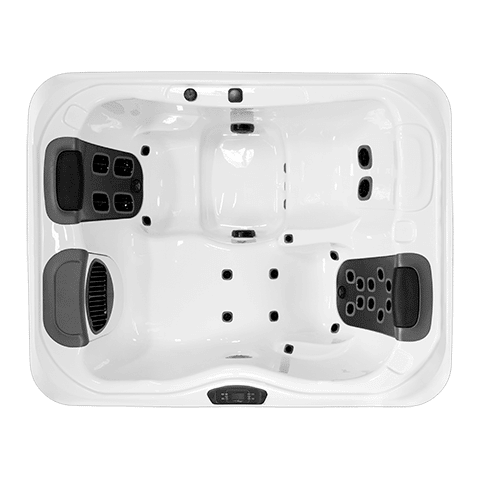 More spacious than any other medium hot tub in its class, the R7 comes equipped with 2 comfortable captain seats along with wrist, hip, and foot jets for the optimal hot tub experience. This spa offers 4 customized JetPaks for premium comfort and relaxation at a price you can afford. Relax after a long day in the R7L hot tub. Features include a bent-knee lounge seat and 4 personalized JetPaks for personalized relaxation. Reasonably priced, with ample therapy options, you will enjoy the luxurious features and a premium hot tub experience without breaking the bank. The R6 hot tub model is designed for installation in smaller spaces without sacrificing comfort and room on the inside. This spa is configured for maximum comfort at a price you can afford. Featuring 3 JetPaks of your choice, this spa can accommdate up to 6 adults. The perfect value spa for your balcony or patio, the R6L hot tub comes with 3 personalized JetPaks, a bent-knee lounge, calf jets and foot jets to create an ideal relaxation experience. Versatile seating and a compact footprint make this an incredible hot tub for couples, small families, and singles. Ideal for singles, couples, and empty-nesters, the R5L provides soothing therapy at a reasonable cost. The R5L comes with a comfortable lounge seat along with 2 personalized JetPaks. Sit back and enjoy relaxation and comfort in your roomy X8 spa. Designed to provide you with the most luxurious experience, without breaking the bank, this hot tub is perfect for large families or those who love to entertain. With open seating and plenty of space this is an investment in your health you'll be glad you made. The X8L is the perfect spa for those looking for space and therapy at an affordable price. This spacious hot tub comes equipped with a full-body lounge and seating variety to give you the best hot tub experience. Relax in this spa after a long day, enjoy some quiet time with your spouse, or invite your friends over for a fun night. The X8L spa can do it all. The X7 spa feels much larger than its dimension indicate, without sacrificing anything in terms of therapy and relaxation. With an ergonomic design and open layout, this spa creates the perfect relaxing moment after a long day. At a price that fits nearly any budget the X7 is a great investment in your wellness and happiness. DIMENSIONS: 7'-4" (2.24m) x 7'-4" (2.24m) x 36 (.91m)"
The X7L seats up to 6 people comfortably. With a full-body lounge, and spacious seating, this hot tub ensures you get the maximum hydromassage therapy experience to help you relax and unwind. The surprisingly spacious design is also a perfect environment for family time and entertaining. Built for versatility and space, the X6L provides an unbeatable hydrotherapy experience in a space-saving layout. This spa can seat up to 6 adults and is fitted with a comfortable lounge seat, corner captain seats, and a very comprehensive array of jets. Perfect for a quick escape or spending quality time with your special someone. A classic design, the X6R round hot tub offers a relaxing and fun spa experience. This X6R is the perfect spa for entertaining a small group of friends or having fun with the whole family. The X5L is compact and easy on the budget, without sacrificing quality and reliability. Sized for indoor or outdoor installation, this is the ideal hot tub for singles or couples who are looking for a relaxing intimate experience that's easy to afford. Enjoy relaxtion, meditation, or a romantic evening with your spouse in your X5L.